I set the alarm for 5:10am and was hiking by 6:10am. It tends to take me about an hour to pack up in the morning. Temps lately have been considerably colder. 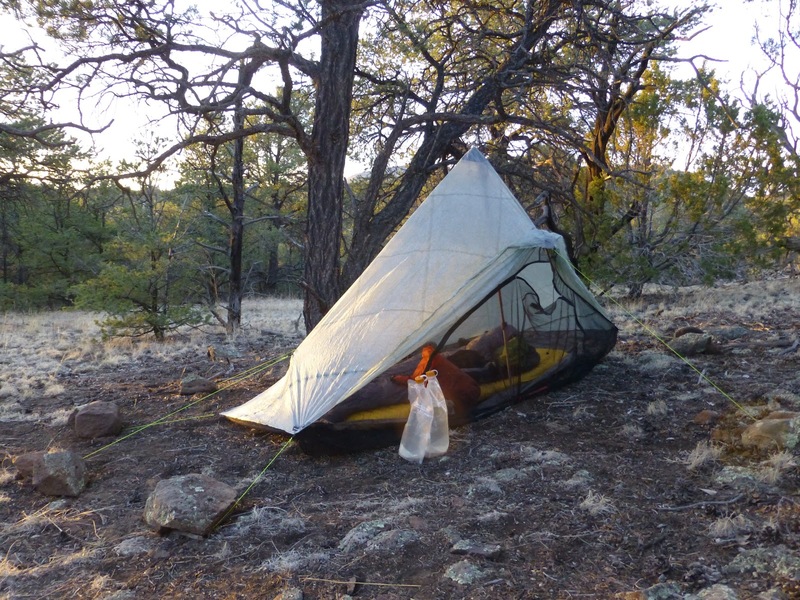 I could see my breath inside my tent this morning and it was 28 degrees when I started hiking. Brrr! On long legs like this one I like to get up early and put in more miles because there is a lot more room for error and I like to buffer. I’m going to say that the tent has grown on me and it’s doing well. I still like my other tent, but this one is good for this trip. My sleeping bag is really warm and I didn’t even wear my down jacket last night. I even made it most the night without my beanie. Maybe I’m just warm from hiking so much, but I’m glad I’m not cold! Fortunately, once I start hiking in the morning, it hasn’t been windy and it warms up quick once the sun comes up. Still, today was probably in the 50s. It was another boring road walking day. The whole next two days into Pie Town is expected to be this way. of course I’ve also ran the battery out on my MP3 player, so I was alone with my thoughts and any random cows I got to shoo away. This my view most of today heading uphill. I also had to carry 4.5 L of water (9lbs) because I wasn’t sure about the sources ahead. 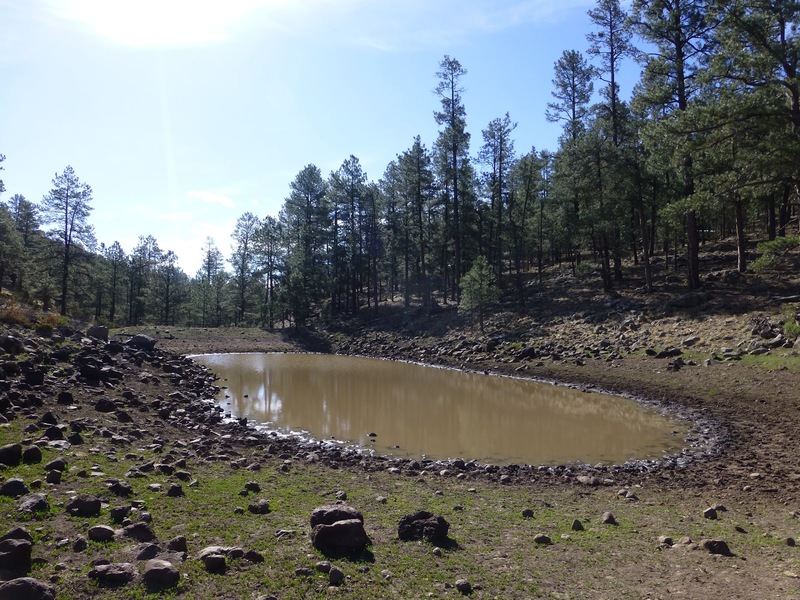 This muddy water tank would be my water for dinner if I didn’t find anything better along the way. 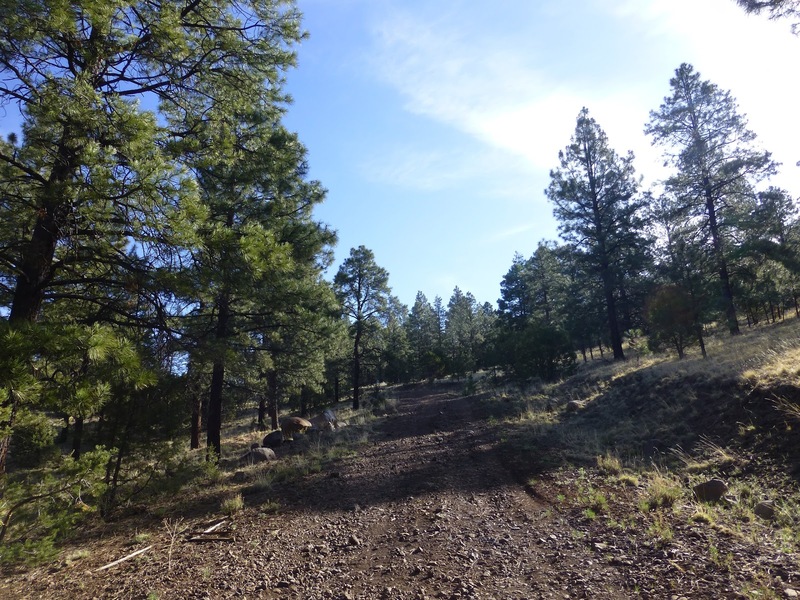 There was a long uphill along the winding road as it ascended the mountain. My motivation was lunch at the top. The highpoint of the day, both literally and figuratively, was atop Mangas Mountain at 9,691ft. There is a fire lookout tower up there if you are paying attention. It is hidden by trees, so many hikers walk right passed it. 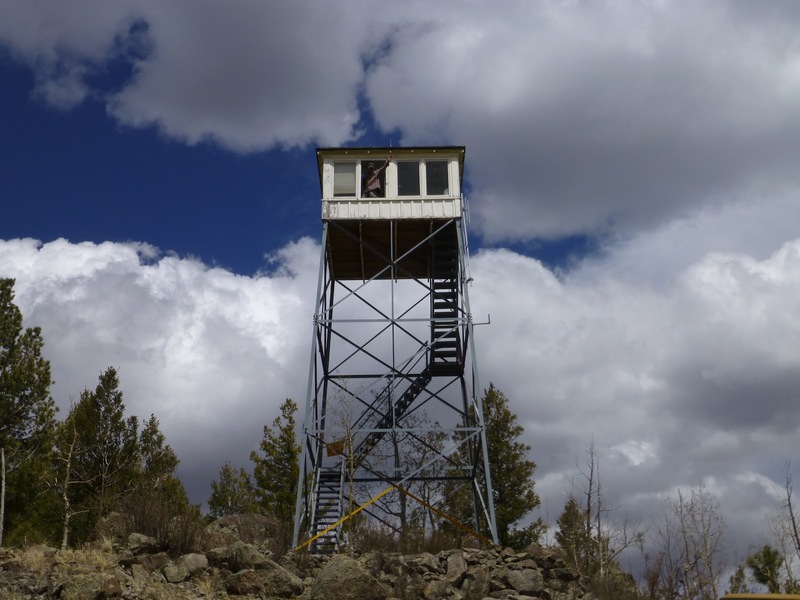 I had followed Shroomer’s CDT trail journal last year and I remember him visiting a really cool lookout tower, so when I saw it suggested on the map, I thought I’d check it out. Right when I turned the corner, Dave who mans the tower yelled down to me and invited me up to the tower. So cool! Here’s Dave waving from his window in the clouds. It was wonderful up there and Dave was so friendly and positive that I stayed for practically two hours! 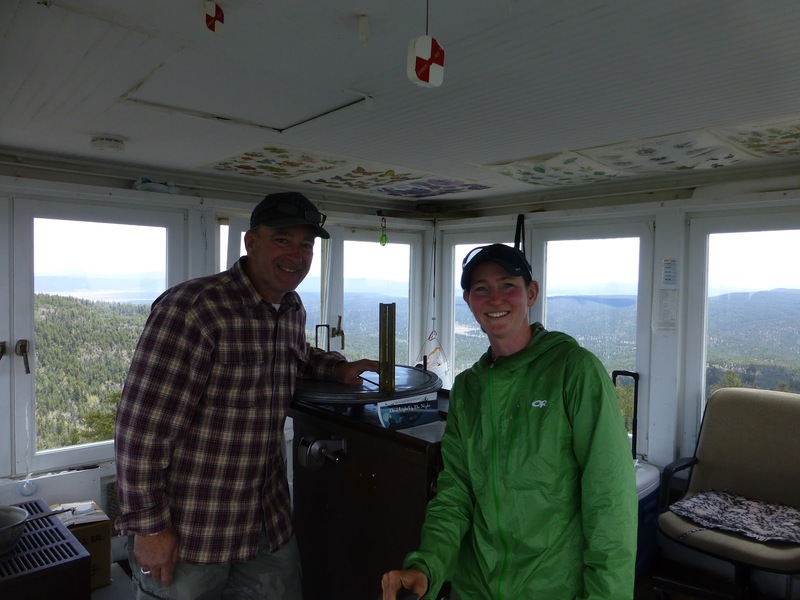 He has a great deal of enthusiasm for his job and for the Continental Divide. He talked about how the divide is the backbone of the world and how it runs all the way from the southern tip of Argentina to the northern tip of Alaska. I knew this, but being up there to see it while hearing it out loud really drove it home. It really got me pumped. He also talked about his connection of the Divide with his experience and study of the Hopi culture and what the Divide means to them. There is no way I could do it justice the way he did in explaining it, but it was very inspirational. He was too shy to be videoed, but I did get some pictures. Dave showed me where I was headed and all around. 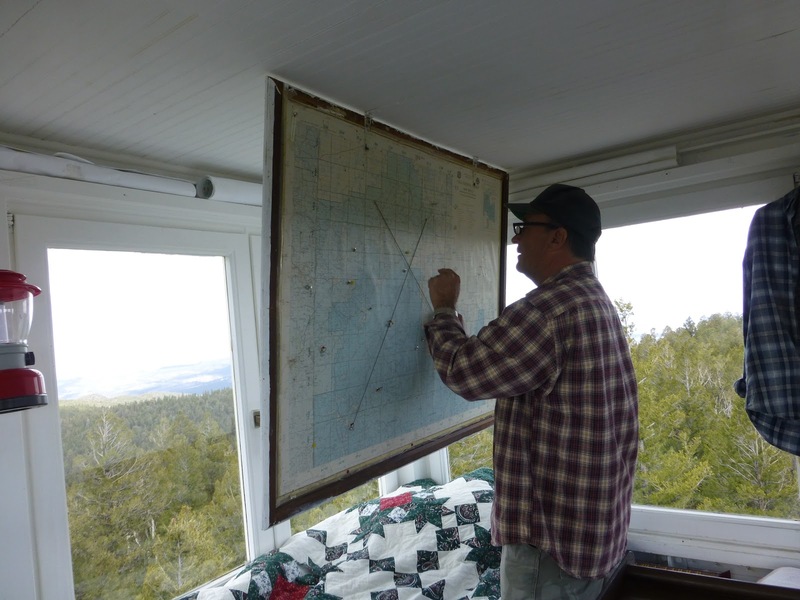 The tower was constructed in 1934 and there are many others in the area that the Mangus Lookout communicates with. 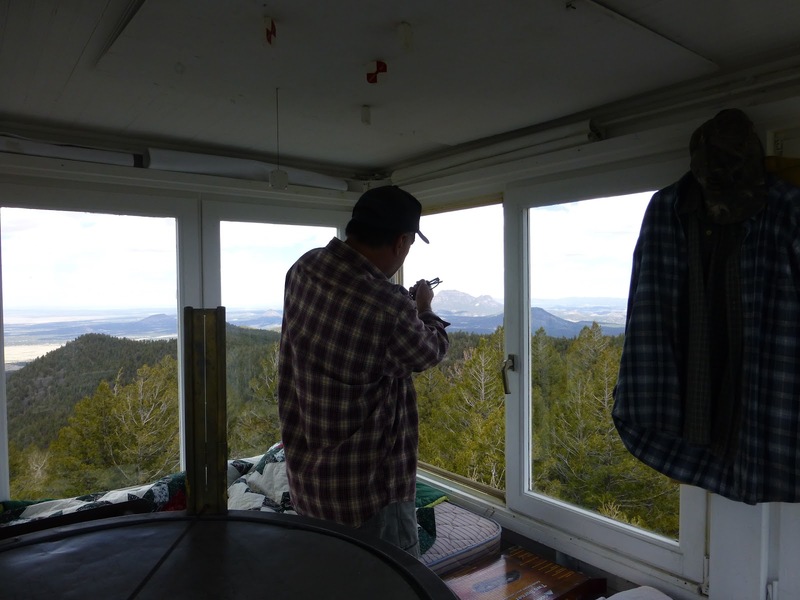 Dave has been at this tower for 3yrs and rotates with another person every five days or so. 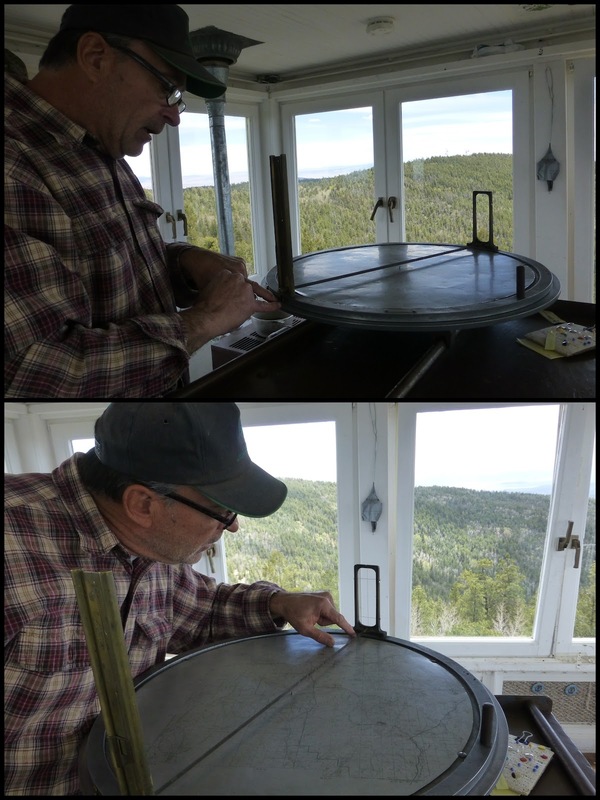 Dave showed me how they use this large dial with a map engraved on it to pinpoint a fire and then triangulate with the other towers to get an exact location. Just amazing! When I left, Dave gave me water (saved me from my mud water!) and also took my trash from the last 5 days. So wonderful! He and his coworker bring up extra water for the hikers. So nice! THANK YOU DAVE!!! You really gave me the boost I needed today! After leaving Mangus Lookout, I noticed that I left my maps to Pie Town there. I had given Dave the maps from the first half of this section to keep and managed to leave them all. I didn’t need them since it’s a road and I have them on my phone and GPS. Just a few minutes later, Dave drove up in his jeep waving the maps out his window. What a great guy! It was a nice downhill the rest of the day. I dodged rain and there might be some tomorrow. I could tell it was falling, but I was so low at that point that it dried out before it hit me. I felt a drop from time to time and was happy to avert the rain. It was a cool view looking back on it. I stopped a little early because I’m 16.5mi from Pie Town and hitting private rancher’s land. I stopped just before some fencing and found a hidden spot among trees up a hill. All staked out for the night and it’s super calm. Hoping it stays that way and that the rain holds off. Pie Town tomorrow! I am FIILTHY! There is no goo water to wash off and it’s been a long leg so a shower and laundry is priority number one!